Mitsui Sumitomo Insurance Group will acquire British insurer Amlin Plc. The deal follows a recent trend of Japanese insurers turning to international acquisitions to hedge against the liability of Japans’ ageing population by providing additional channels for growth. The deal is mainly revenue driven, while another significant factor is expanding the geographic presence across Asia, Europe, and North America. The transaction is subject to shareholder approval, however, the Amlin board of directors is expected to unanimously approve the deal. The M&A environment in the insurance industry is best described precisely with one word: HOT! The number of M&A deals in the insurance sector this year has more than doubled, compared with last year’s figures, which brings it close to the record high of USD 65bn in 2006. More than 20 deals in the first half of the year were valued at over USD 1bn, with the total deal value exceeding USD 81bn USD. Japanese insurance companies have been the most active and account for more than 35% of the total value. Insurers from the land of the rising sun have been working hard to diversify their business and enter new markets due to the gloomy outlook for the domestic business. The insurance business in Japan is affected very negatively by the relatively frequent natural disasters and the negative population growth. Moreover, the price competition has intensified significantly and insurance customers prefer buying products only from the largest companies. Therefore, firms have been seeking investment opportunities in the largest insurance markets, as well as emerging markets, where there are bigger growth opportunities and some companies seem to be undervalued. Amlin is an UK based independent insurance group that was established in 1998 after the merger of Angerstein Underwriting Trust and Murray Lawrence Group. The firm is organized in 3 core business units, focusing on the provision of insurance cover to enterprises and reinsurance protection to other insurers. It is one of the largest and most sustainable companies in the UK and it is part of the FTSE 250 index. Amlin has been placing efforts to expand its business in the recent years, through organic growth and acquisitions. In 2007, it acquired Anglo-French Underwriters and later rebranded it to Amlin France. In 2009, it acquired Fortis Corporate Insurance; a Benelux based insurer and Crowe Livestock, a livestock animal insurer. Its’ most recent deal is the acquisition of the marine insurance specialist RaetsMarine. Moreover, the company opened a branch in Miami last year to cover Latin American reinsurance and another office in Dubai this year. Mitsui Sumitomo Insurance Group, a subsidiary of one of the largest property and life insurers in Japan and in the ASEAN region, is another important player in the global insurance industry. The company was formed in 2001 through a merger between Mitsui Marine & Fire Insurance and Sumitomo Marine & Fire Insurance. Since then, the company has made investments in several countries outside Japan including: Korea, China, Thailand, Taiwan, Cambodia, Malaysia, India, Indonesia, making it a key player in the region. In 2004, it acquired the Asian non-life insurance business of Aviva. 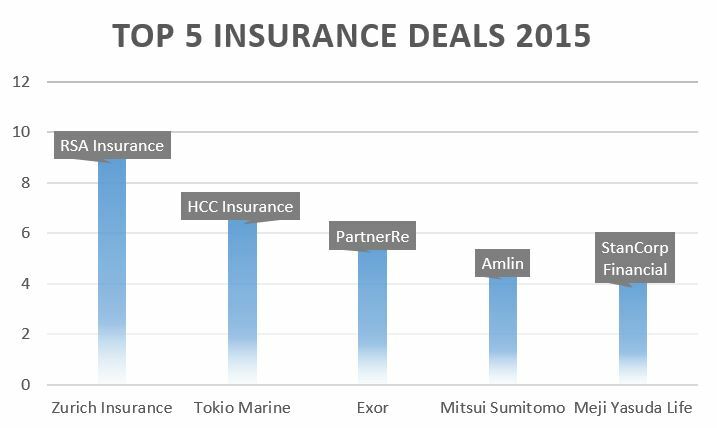 Other top deals involving Japanese firms include: the acquisition of Symetra Financial Corp by Sumitomo Life Insurance, the acquisition of StanCorp Financial by Meiji Yasuda Life Insurance and the acquisition of HCC Insurance Holdings by Tokio Marine Holdings. Amlin, founded more than 100 years ago, was targeted by Mitsui Sumitomo due to it’s potential synergies in revenue streams and enhanced competitiveness due to size. Amlin operates in the Lloyd’s of London marketplace, where specialist companies join to share the risk in underwriting policies. Mitsui Sumitomo sells insurance through the same platform, where premiums for several types of insurances have come under pressure due to price competition. Given that half of Amlin’s revenue comes from reinsurance, the most price-competitive service, this merger will give them a larger scope to compete within the sector. Another important driver is due to the domestic insurance market of Japan, where insurance firms face the unique environment of a declining, aging population, within a country prone to natural disaster. This makes operations very costly for Mitsui Sumitomo’s parent company and other Japanese insurance firms which is a driver of the diversification to foreign countries. Amlin has a strong presence in the UK, Europe and North America, which not only reduces the average amount of liability over their coverage network, but gives the combined company a larger revenue platform. Chief executives on both sides of the deal remark corporate values alignment as an important factor of the deal. The compatibility of the two not only increase the scale, scope, financial capacity, and revenue stream, but also complement eachothers corporate strategy and culture. Cost-cutting measures such as downsizing the workforce are not expected due to the lack of geographic overlap between both companies. MSI offered the shareholders of Amlin GBP 3.5bn, or 670 GBP per share, equal to a 36% premium on the price at the time of the announcement. The deal will be financed primarily with cash and is expected to be completed in the first quarter of 2016. The news comes shortly after Amlin’s chief executive Mr. Philips initially announced last Tuesday that the company was not considering to be acquired. Amlin did not expect counterbids since it did not undergo a formal sale process given the attractive proposition and transaction price by MSI. Workforce downsizing of the 1,900 Amlin employees and other significant restructuring is not expected as the companies operate in limited geographic overlap. Most likely, the management team of Amlin will also remain. Evercore, Rothschild, Morgan Stanley and Numis advised Amlin, while Goldman Sachs and Nomura advised Mitsui Sumitomo.